Published January 6, 2017 by Tooth Fairy. Filed under Health. Total of no comments in the discussion. Research has shown that gum (periodontal) disease is associated with several other diseases. For a long time it was thought that bacteria was the factor that linked gum disease to other disease in the body; however, more recent research demonstrates that inflammation may be responsible for the association. Therefore, treating inflammation may not only help manage periodontal diseases but may also help with the management of other chronic inflammatory conditions. Research has suggested that the relationship between diabetes and gum disease goes both ways – periodontal disease may make it more difficult for people who have diabetes to control their blood sugar. Does your child have some white markings on their front teeth? Published February 12, 2016 by Tooth Fairy. Filed under Health. Total of no comments in the discussion. Although teeth are the hardest parts of our bodies, they do have one weakness: they can be easily destroyed by acid. Plaque thrives on carbohydrates, sugar and acid and this combination, found in many of the drinks we consume, is what can ruin our teeth. The acidity of substances is measured using the pH scale. The lower the pH a drink has; the more acidic it is. Many well known drinks have a low pH, which means that they contain a lot of acid. Published February 5, 2016 by Tooth Fairy. Filed under Uncategorized. Total of no comments in the discussion. 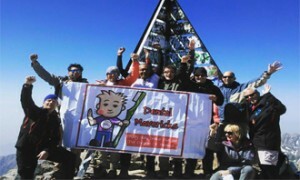 Dental Mavericks travel to the Atlas Mountains in Morocco to treat children in dire need of dental care. Published February 3, 2016 by Tooth Fairy. Filed under Health. Total of no comments in the discussion. New research has suggested that postmenopausal women who suffer from gum disease are at a significantly increased risk of developing breast cancer. It could be that gum disease means there’s kind of a general inflammation in the body. Inflammation is related to a number of cancers and stroke and heart disease, so it could be that chronic inflammation is causing both. Published February 13, 2015 by Tooth Fairy. Filed under Adelphi Dental Centre, Cosmetic Dentistry. Total of no comments in the discussion.